Kaizen is a Japenese word that means continual improvement through small incremental steps. We chose the word Kaizen for our organisation because we believe that it is a great fit for our work in the community sector, where we should always be looking to improve what we do. No matter how successful something is, we will talk about how we can improve it the next time. Here is a recent example of this process in action, with the result being what we think is a really useful innovation in consultation. In most consultations it is a good thing to include some form of focus group as part of the methodology. But there is a fundamental problem with focus groups that is as follows: in general, only a very certain type of person will attend. The customary response to this fact is to widen that group by use of straight out bribery – free food, gifts or other incentives. This in turn has the result that the focus group may well be attended largely by people who are interested in the loot, not the discussion. These are serious limitations on the reliability of the information coming out of most focus groups. Now, these are one-on-one conversations, they produce great qualitative and quantitative data, and really work well. But they aren’t group discussions; and there is something different and exciting about having a discussion about the issues rather than working through the medium of a questionnaire. There are various issues with the traditional focus group. The first is the reason above – the people attending are a self-selecting and niche group, who have the inclination, time, capacity etc for that type of process. The second issue is not about the focus group itself, but about a challenge in doing street engagement. 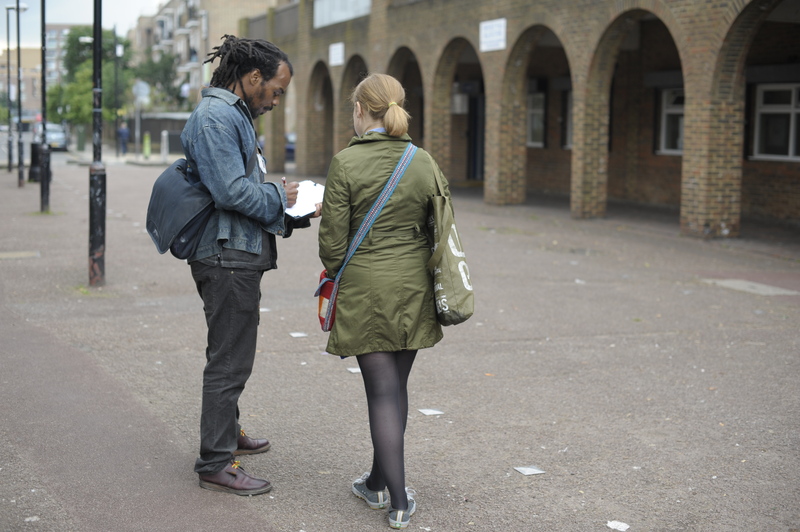 When you are out doing street engagement there are often times and situations when you cant always isolate an individual to do a one-on-one questionnaire because they are in a group. Examples of this could be mums outside the primary school, teenagers hanging out in an estate late at night on a summers evening, a family having a picnic in the park. People in groups are in this way excluded from most street consultation, and that means their voice is not heard. So, in response to these issues, we have pioneered what we call “street focus groups”. Just as it says on the tin, it is a focus group discussion, held on the street – with no bribery and no incentives, beyond the conversation itself. And it works. It works really well. This is an exciting new technique that we now use in all our consultations, and it means we can effectively have lots and lots of focus groups, with different sorts of people, in different sorts of places. These street focus groups last from between 15-30 minutes and cover a range of questions, in a semi-structured process. We may talk about just one aspect of the project or cover several – it really depends on where the conversation goes. On a recent project for the Canal and River Trust as part of a medium size engagement (500+ people) we conducted 23 street focus groups with over 130 people participating in them. We also did 1 normal focus group, well, normal except for the fact that we held it on a moving boat which meant we literally had a happy, but captive audience for 1.5 hours. So, its not like we are abandoning sit down focus groups of the traditional kind, but they will from now onwards be the exception not the norm for us. If there is a particular reason that has them be a reliable methodology we will use them. But I couldn’t think of ever doing a community consultation again that didn’t have street focus groups as a central part of the methodology. There is no magic to the street focus group, and we think that it could really add benefit to lots of consultations that genuinely want to reach out beyond the usual / bribe-able suspects. If you do consultations, then I encourage you to try it out and see what you think. If you commission consultations, then I encourage you to start asking delivery organisations to do them. These street focus groups look like a really interesting and unique technique to conduct market research. I especially see how they can be helpful by making the experience an interesting one for those getting interviewed as well those conducting it. One thing I’d just like to add in regards to the approach is that it might be helpful for some businesses to hire an outside firm to conduct such a type of Focus Group session for them, particularly if they’re strapped for time. One company I know of that actually does provide such a service is called SQM (linked: http://goo.gl/DWbZx1). I think any business could benefit from hiring such a service and combining the techniques mentioned in the article. Kaizen have just undertaken street focus groups in Kingston and they have been highly successful giving a great insight into local people’s priorities for transforming the housing service. These guys really know what they are doing. It gave me a complete new way of looking at things to benefit not only my job but also my life. It was just what we wanted as a team. A super event, highly recommended, with a superb facilitator to help us develop.